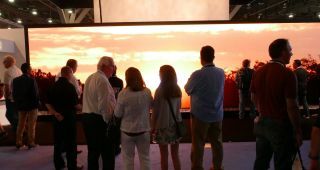 Sony is set to exhibit a range of its latest visual solutions at ISE in 2017 with a focus on collaboration and communication in corporate, education, and large-format displays environments. The focal point of Sony’s presence will be its CLEDIS display technology, which delivers 8K visual experiences by combining a high-contrast image (more than 1,000,000:1) with 1,000 nit brightness, and no artefacts due to uniform brightness intensity. Pixel drive circuitry provides a fast video response time with a frame rate of 120fps across a nearly 180° viewing angle. Sony will showcase its range of SXRD projection solutions to enhance visual simulation and entertainment applications such as flight simulation, theme parks, and visitor attractions. Models on display at ISE 2017 will include the VPL-GT280, with 5,000 lumens brightness. Also on show will be real-time multimedia sharing and collaboration solutions, including the SRG-120DU full HD remotely operated PTZ camera, along with a new laser projector. Additionally the entire BRAVIA display range will be exhibited, combining image quality, reliability, and low running costs. The BRAVIA series now includes the 100in FWD-100ZD9501, delivering 4K HDR picture quality for high-end corporate, signage and post production applications. Visitors can also experience TDM Digital Signage software, which allows users to create eye-catching multimedia experiences, for reception areas, school sports halls and cafeterias.